The Hickory Lots is located in the heart of the Historic Core district. The most prominent feature on this site was the group of mature trees – some of the few trees in the entire West Bottoms. Their wide canopy shaded a gravel parking lot below. During First Fridays and other events in the Historic Core, this parking lot is well-used as it is adjacent to numerous shops as well as the haunted houses. A group of antique stores inhabit warehouse buildings south of the site, a series of automotive shops exist north of the site, semi trailer parking and railroad border the west edge of the site, and a boxing club and more gravel lots form the east edge. The site suffers from leaky, undefined boundaries and therefore no clear sense of space and place. It was the mature trees that captured KCDC's attention when first considering this site. However, during our site selection process, the trees were cut down and removed from the site, leaving only their tall stumps to mark their existence. The trees were dying and posed a threat to the vehicles parked below them. Due to the openness of the site, one can experience a prairie-like setting that allow for extreme views – downtown Kansas City, Missouri to the east, the 12th Street Viaduct to the south, and the rail lines as well as the trains that frequently pass by to the west. Many of the surrounding buildings have scars of their past lives that give a sense of void or loss to the site, compounded by the remaining tree stumps. 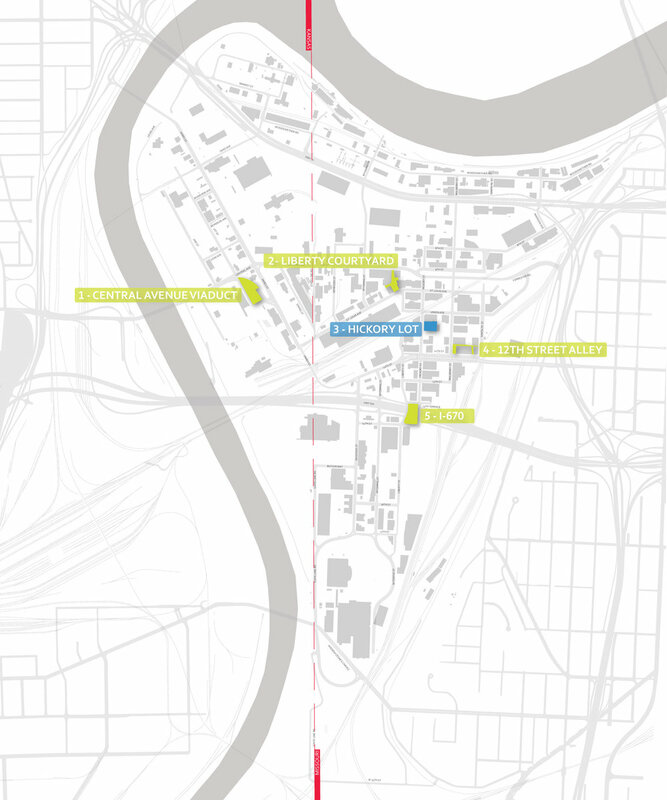 Referred to as "the piazza of the West Bottoms" at the first public meeting, the space is ideally located to become a new center of activity for the already bustling Historic Core. For more information on the preliminary design for the Hickory Lot site, please refer to the KCDC's project publication for the first phase of West Bottoms Reborn.